When you're world is changing rapidly, take time to make art. Here's this week's little quilt, #9/52.2009 ~ "Fool's Gold." The top is a number of small pieces of cotton fabric that I used to make rubbings with Shiva Paintstik (there's no "c" in that word). The darker fabric was one long narrow piece of Osnaburg cotton. The Paintstiks are very cool, especially the metallic ones. Fabric artists are doing incredible things with them, and I hope to do lots more. I feel a nap coming on. I am shedding layers of my onion-self, and letting go of more and more with each sloughing off. It is exhausting. More later, or soon anyway. Since I last wrote just a few days ago, I've been in a whirlwind. 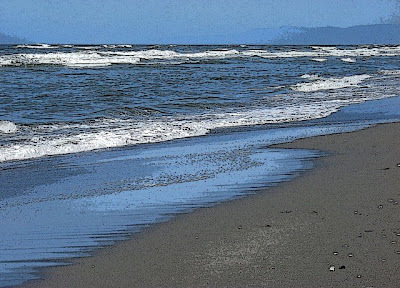 I am moving my home and studio within the next month down to Fortuna, 15 miles south of Eureka. Leaving this house, which I rent, is something I've essentially been on the verge of for years. Everytime my financial situation changed, moving has been an option. Every other time before, however, something worked itself out so that I didn't have to move. But now I have to. I'm out of money, deeply in debt, and my income has been virtually non-existent for the last six months. It's all good, though. After a false start in this direction last June, now I am really psychically ready to do this. In the past few days I have gotten rid of so much stuff, I can hardly believe it. Fortunately my spiritual community is having its annual rummage sale in about 10 days, and basically all my castoffs are going there. I've already donated four large carloads. Between rooting around my house for stuff to give away, I've been working on my art quilt group project plus this week's 10x10" piece. Both are ready to quilt now. What my new situation looks like is that I will be living with my partner Scotty, in his small mobile home, and I'll have my studio in a small apartment located on the grounds of the mobile home park we'll live in. It's very unlikely that I'll have room for my loom, meaning I'll be storing it for a while. Which is fine by me right now. I have a stack of handwovens to surface design, and I'm mostly quilting these days, anyhow. I am planning to have space in the new studio for wetwork as well as a big studio table for everything else, and hopefully room for another smaller sewing table. The cool thing is that Scotty has been essentially rebuilding the apartment, so it'll be brand spanking new for me. Thank You my love! I have to say that it is incredibly refreshing to be going through every single thing I own and letting go of so many things. Including a lot of beautiful things I made over the years. I've had my use out of them or just enjoyed having them, and now it's time to pass them along. Not long ago I never imagined I'd be able to let go of so much. I'm glad I've finally gotten to that place where I no longer need things to define myself. And in terms of things that I've created, for a very long time I've seen myself as one who is constantly creating art of one sort or another and letting it go out into the world. I've always been generous with things I make, whether I get paid for it or not. I just have to be making things and I hope that never stops. I'm giving myself a Gold Star for the additional weekly quilt I made yesterday. So I made two 10" x 10" quilts this week, although I did little else! 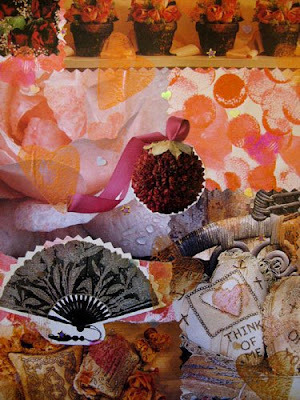 This one here, 8a/52.2009, entitled Postcards From The Edge, was made with some of the original digital printed images that I had intended to use on the bigger piece I am doing for my art quilt group project. I didn't want to waste those images on fabric! And although it's kind of hard to tell from this image, I quilted it with metallic thread. 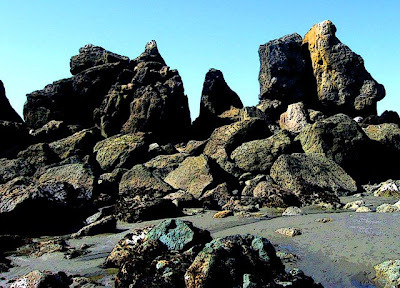 These particular images, especially the big photo of the rocks at the top, definitely reminded me of those old hand-painted photo postcards from the early to mid-20th century. Hence the name of the quilt. This week's little quilt, 8/52.2009 ~ A Day At The Beach. I've had the beach on my mind this week, as I've been working on a 14" x 16" quilt project for a local art quilt group I recently joined. Each of us is doing a quilt to represent some aspect of life in Humboldt County. My theme is the ocean or the beach. I had an idea in mind for the project quilt, and that inspired me to make this week's little quilt on the same theme. But after I printed some photo images on fabric for the bigger piece, I decided against the original design because I like better how the little piece turned out. So the bigger one is back on the drawing board again. I have a few different photo images in mind and have already manipulated them, so now I'm just deciding on how big to print them. A Day At The Beach has the binding turned to the back this time. I.E., I made the top bigger than the backing and batting, then turned it to the reverse and hand stitched it. This was a little bit of a challenge because of the numerous layers of fabric on some of the edges. Next time I do this I'll make the face even bigger. Today is my 60th birthday...and here's my "centerfold" morning collage. Notice a little photo of me, actually from 1979, atop the body of the b & w newsprint image on the left page. Most of the other images are recognizable (or not) works by other artists. All, though, represent aspects of who or what I imagined myself to be at 60. So we'll see how that pans out! Trust is my word for this year, I just remembered (! ), and today, especially, would be a good day for me to renew my commitment to live in trust. And not be attached. And be open to whatever the Universe has in store for me. And accept it gratefully and gracefully. So Happy Birthday to me, Pisces/Virgo/Scorpio woman! Here's a little quilt I completed this weekend, entitled Zen Rocks. It's a standalone piece, meaning not part of my growing series. 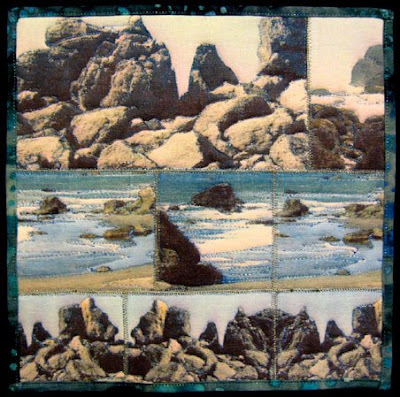 Zen Rocks is a wholecloth piece of cotton that was dyed, printed, and screened. The backing and binding are a commercial batiked cotton that matches the top perfectly. Finished size is 9.5" x 23." I haven't posted it on my website yet -- it might be a personal piece, although I have absolutely no wall space to hang it at this point. So its temporary destination might just be that growing stack of small studio quilts! 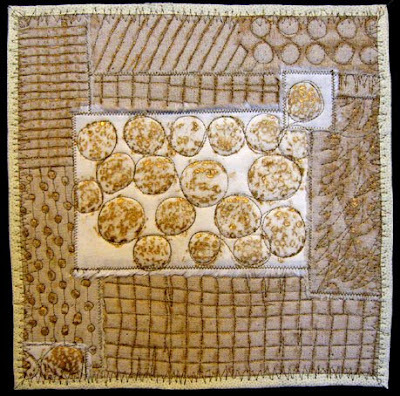 I have to say this about studio quilting -- I'm hooked! I think quilting is more fun than any other medium I've tried over the years. Everything goes, and I love that about it. Here's my collage du jour from this morning. Some of you won't be reading this until Saturday morning, which is why I'm posting this Valentine on Friday the 13th. Besides, Friday the 13th is always a good day for hearts and flowers! Leah posted on her blog this morning a wonderful short talk by Elizabeth Gilbert, author of Eat, Pray, Love, talking about where creative genius comes from. Here's a link to the 19-minute video. Consider it my Valentine gift to you! 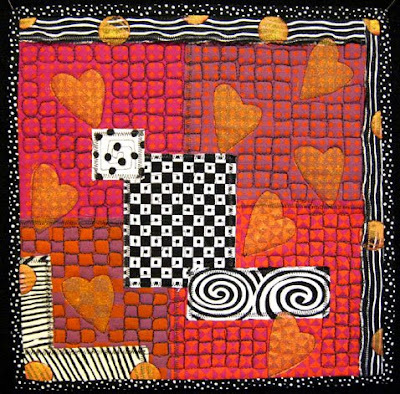 In honor of Valentine's Day this Saturday, here's my weekly quilt, 7/52.2009 ~ My Funny Valentine. I'm not a big fan of the color red, so I prefer to use colors that read as red -- you'll notice that the colors in this piece are magenta, plum and orange. But it reads as though it were red, and that's good enough for me. 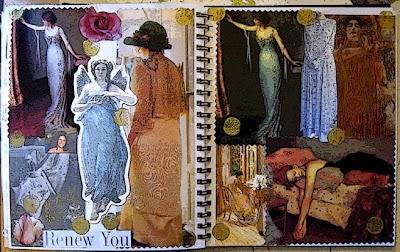 This was a fun little fabric collage that I also stamped on with metallic paint. I particularly like quilting those painted areas. I'm actually not completely satisfied with the quilting on two of the center black & white pieces, and may redo that part. Depends on how much of a perfectionist I feel I need to be! I finished another piece of art cloth today, called Heavenly Bodies. It's handwoven black cotton on black cotton on which I discharged the warp with bleach before putting it on the loom. The weaving pattern is an 8-shaft network twill. The next step was to over-discharge big stencilled spirals, again with bleach. Today I finished it off by printing on several colors of Lumiere textile paint with various objects and hand-cut stamps. I'm really happy with it, and it does look to me like the heavens up close. So I guess you could say I've had a heavenly day! And speaking of stamps, over the last several months I've cut stamps from a variety of media, including lino blocks, easy cut carving material, rubber gasket material and whatever else I could find. By far the easiest to cut and to use is the sticky-backed foam sheets that I adhere to thicker foam after the design is cut. That foam takes dye, paint and ink much more easily than the lino blocks (which at one time was all you could get to cut stamps with), and the foam base makes them extremely easy on the hands to press an impression with. That's just an FYI if you're into cutting your own stamps! 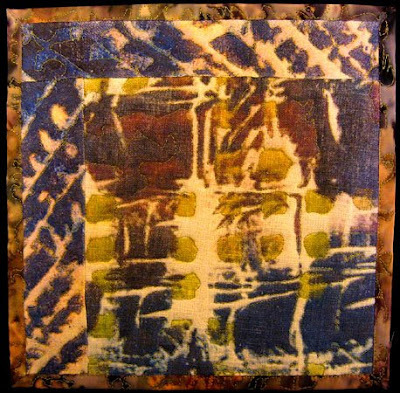 Here's my sixth weekly quilt -- 6/52.2009 ~ Abstraction. The front/top of this piece is entirely digital images, two actually. The strips on the left side and top are the other half of the image that I used in yesterday's quilt, Discharge Series, 5. This image was printed on an old linen napkin. The larger image on the quilt above was printed on cotton/rayon, one of my favorite fabrics. It quilted really nicely, as well. Other than using the two digital images, what I did differently on this weekly piece was add machine quilting to the binding after it was hand stitched in place. Looks like we're in for some rain between tonight and Friday. We sure need it. I miss falling asleep at night listening to rain on the roof. I haven't heard enough of that this year -- yet. Weather patterns can change on a dime. And we've had very rainy springs some years. So who knows what's to follow, this year. Just another outrageous day in paradise (read: spring-like weather in mid-winter) and I finished another quilt in my Discharges Series. 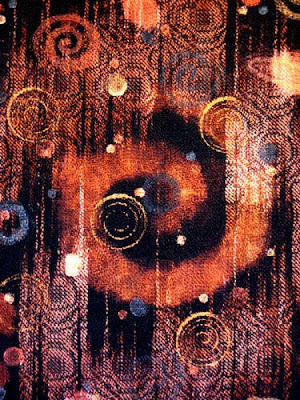 This one, number five in the series, is 22 x 10 inches and includes a digital image of dye printed raw silk along with the discharged fabrics. 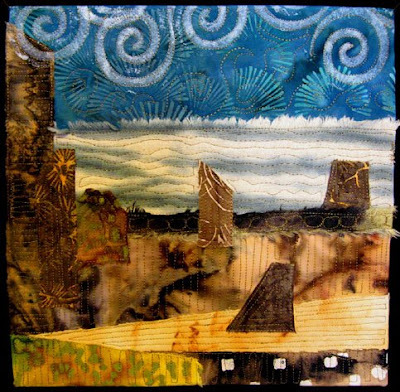 This quilt also completes an assignment from The Art Quilt Workbook to create a quilt with a digital image or based on a digital image. This is actually the third piece that satisfies that assignment. But it's the only piece of the three that combines the assigned task of using digital images with my theme of using discharged fabrics -- my chosen theme for all quilts made in conjunction with my work in this book. I've been posting all the finished quilts that are available for sale on my website. You'll find them in the Studio Quilts section. Email me if you're interested in purchasing, and I'll send you a PayPal invoice.